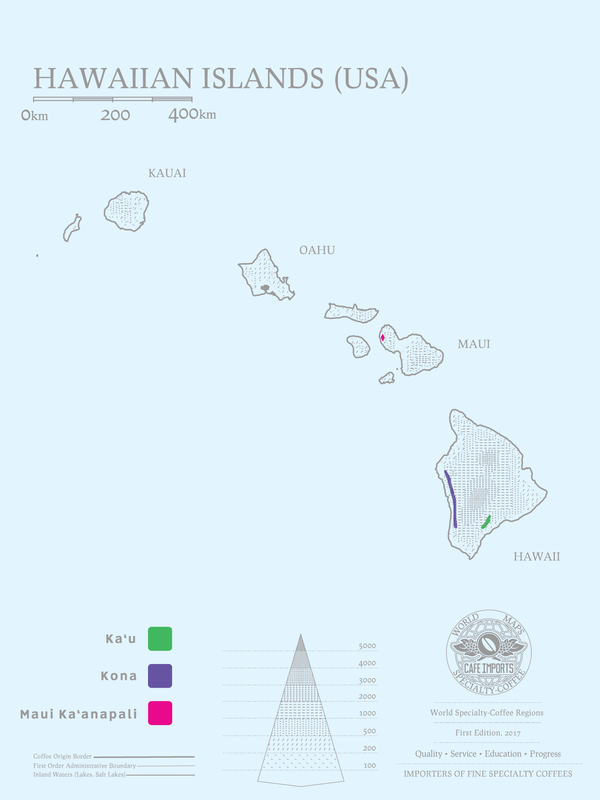 The only commercially grown coffee in the United States of America is also found in its most remote state, the group of islands collectively known as Hawaii, which joined the union in 1959 as the last incorporated state. Its history with coffee goes back much further, however: The first plants were brought to O’ahu in 1813, though sugar far outshone coffee as an agricultural output for the farmers. In the late 1820s, Bourbon variety coffees were brought to the Big Island, and the next decade saw the establishment of the first coffee-focused estates. Between disease, pests, and economic disparity, coffee has had a changing degree of significance to Hawaiians: When sugar production was profitable, coffee suffered; when Brazil’s coffee yields dropped due to frost, coffee production in Hawaii peaked at more than 15 million pounds. It wasn’t until the late 20th century that Hawaiian coffee sort of “came into its own,” with the decline of sugar and pineapple growing, as well as an increased attention paid to “gourmet” and specialty coffee. Coffee, like wine, comes with a host of conflicting information: Does price equate to quality, or not? The answer is complicated, and coffees from Hawaii are no exception: Certainly there are beautiful (if fairly mild) cups to be had from the islands, and innovations in processing techniques and attention to detail have done wonders for bringing truly fine Hawaiian coffees to market. However, as the only coffee grown in a developed nation—as such, protected by American labor and wage regulations—and in such small supply due to the limited available farmland, coffees from this island state are naturally going to come with a heftier price tag than others. Most lovers of Hawaiian coffees love their balanced, mild and clean profile, that classic Bourbon sweetness. Perhaps the soft nutty flavor recalls mornings spent on a honeymoon in an island breeze. At Cafe Imports, we are also seeking out those small-farm lots that display special character in the cup, as well as interesting rarities like certified organic offers, and offbeat island origins. We continue to seek new relationships with Hawaiian growers, and think that the best is yet to come from our friends in the Aloha State.